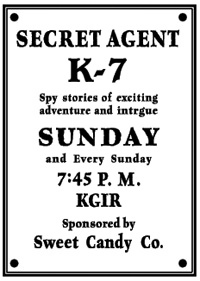 on land, on sea, and in the air--brings you a story today..."
These fifteen-minute episodes of mystery and espionage from the 1939 broadcasts begin with a prolonged organ intro so the local announcer could get in a couple of commercials for the local furniture store or dairy! Each single episode lasted about 12 and 1/2 minutes, but each "case" is really quite interesting and exciting. Agent K-7 is actually a rather mild-mannered narrator of these stories. He doesn't sound or seem very heroic or interesting... which would make him more effective as a spy! The spy's best disguise is a perfectly ordinary and uninteresting demeanor. The radio actors who brought these stories of men and women operatives to the radio are as unknown today as most of the real spies of that time. The stories are drawn from the headlines and fears of 1939 (and now?) Here are a few examples. "Suicide Ships," "Fortified Borders," "Poisonous Gas," "Undesirable Aliens," "Fraudulent Passports," "Secrets Leaked," "Government Overthrow," and "World Crisis." Sounds like current events. "Exactly the kind of activity that a spy would take advantage of," to quote agent Z. 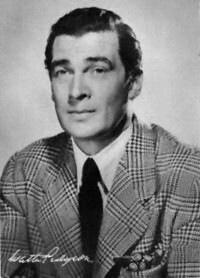 The fine actor Walter Pigeon plays Agent Z in some of the episodes. The sound quality of these shows is very good, and together they offer another radio view of our history. In 1939, our popular media was not afraid to present stories of the enemy and the heroics of those who fought them. The organ music is florid by today's standards but is enjoyable as a hallmark sound of old time radio's smaller budget shows. The sound effects are capable and offer that old time radio dramatic immersion that modern books on tape simply don't offer. Step into the shadows with K-7… as he returns. Returns from where? He is not telling, and the answer may never be known! For more espionage see also Cloak and Dagger, Spy Catcher, David Harding! Counterspy, This is Your FBI, Top Secret, and I was a Communist for the FBI. Be the first to comment on "Secret Agent K7 Returns"